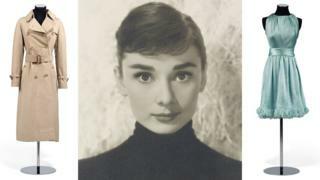 Ever fancied owning a piece of actress Audrey Hepburn? Well, you might just get your chance this September. Items from her personal collection are to go on sale at Christie's in London, among them a Burberry trench coat and a selection of ballet pumps. Portraits, personal letters and her own annotated film script from Breakfast at Tiffany's will also be available. Christie's said the sale would feature "unique personal objects which have never before been seen on the market". They include a letter from Tiffany's author Truman Capote and a cigarette lighter - engraved "For My Fair Lady" - which she received from that film's art director. "We hope the sales will pay tribute to the timeless style of this legendary actress," said Adrian Hume-Sayer, the auction house's director of private collections. The sale is endorsed by Hepburn's sons Luca and Sean, who said they hoped it would allow their mother's "ever-growing base of admirers... to share her spirit". Born in Belgium in 1929, Hepburn appeared in many much-loved films, among them Sabrina, Funny Face and Roman Holiday. The Oscar-winning actress, who died in 1993 at the age of 63, devoted much of her later life to campaigning for Unicef. The auction, to be held on 27 September, will be preceded by an exhibition at Christie's London HQ.